Beer Cocktail with Porter, Amaretto, and Cherry | Good. Food. Stories. It’s no secret that I like beer. I mean, to quote the immortal Lloyd Christmas, I like it a lot. And though the typical overscheduled holiday crush has made me want to guzzle a bottle or two each night, there’s a more elegant and spirited way to bring beevos into the Christmas season—even more so than the always-jolly beer advent calendar. I’m taking beer cocktails. Everyone mentions micheladas and shandies as the two stalwarts of the beer cocktail set, but beer has been making its way into mixed drinks courtesy of forward-thinking mixologists over the past year or two. It’s not just light lagers that play well with strong booze and liqueurs, either: everything from floral IPAs to fruity lambics to rich porters and stouts are getting in the game as the trend gains steam. 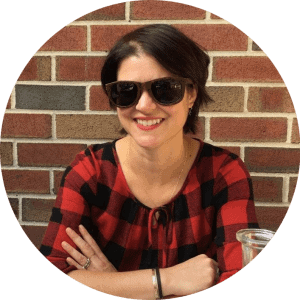 In this vein, I’m filling my glass with The Good Cheer, a cocktail that plays off the idea of spiked after-dinner coffee—only this drink shouldn’t wait for the dessert course to come around. Even better, this cocktail has only three ingredients (though a shot of bourbon would add a little somethin’-somethin’ if you were looking to bump up the booze factor): beer, amaretto, and Cherry Heering—a natural cherry liqueur that’s more mellow than maraschino, more refined than Robitussin. 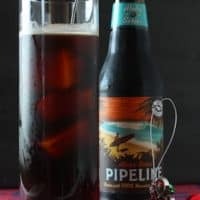 Bringing the big guns and dominant flavor to the drink is Kona Brewing Company’s Pipeline Porter, made with Hawaiian-grown Kona coffee. The essence and aroma of java comes through bright and clear in this porter—it’s roasty and toasty without weighing you down like some thick, heavy dark beers can do. It’s akin to summer’s cold-brewed coffee: intense but completely refreshing (and, since it’s beer, with the added bonus of fizz!). With its nutty, sweet hints of amaretto and cherry, The Good Cheer is filling me with… well, you know… this month. And that’s not just the porter talking. 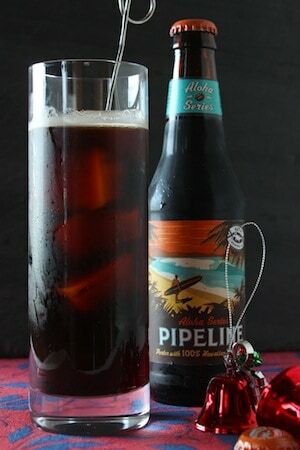 For a holiday beer cocktail with festive flavors, mix coffee porter, amaretto, and cherry Heering liqueur. It's a combination that will give you good cheer! Fill 2 highball glasses with ice. Gently pour the beer to divide between the glasses.